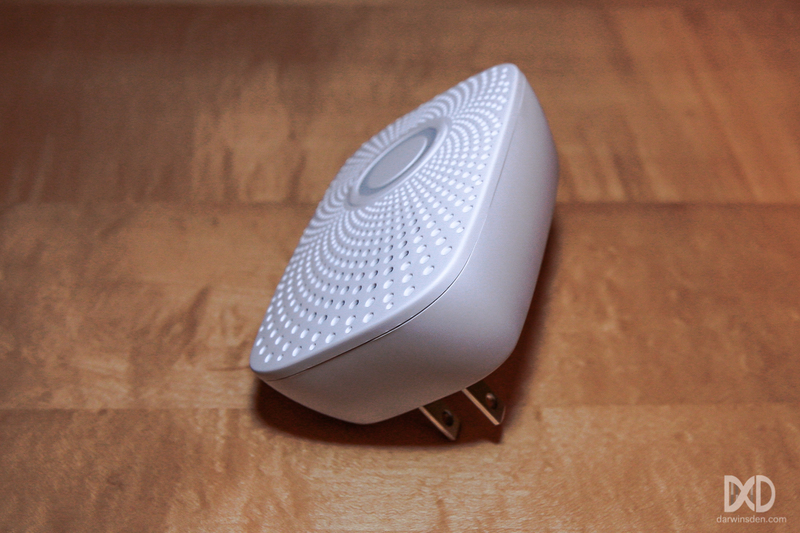 I recently reviewed the Aeon Labs Zw056 Aeotec Doorbell (see the full review here) which is actually two devices: 1) A doorbell button assembly and 2) An AC outlet powered Z-Wave siren/speaker. While I’m not currently using this device as a doorbell, I’ve been very pleased with the speaker’s ability to generically play custom MP3 audio tracks commanded by its Z-Wave interface. I’ve set-up the Aeotec Z-Wave speaker to play various synthesized speech audio clips based on events that can occur in my home automation set-up, such as “water heater leak detected”, “office window is open”, “front door is open”, “front door motion detected”, and my favorite “Diamondbacks game is starting”, which was easily accomplished via IFTTT and a virtual switch. A Home Automation system alternative to Sonos and Ubi? Although the speaker is a bit cumbersome to configure for these custom notifications, at $50, it is a much cheaper solution to other alternatives such as Sonos Play and Ubi. Details on how to integrate the Aeotec Z-Wave speaker with Vera Controllers can be found at airedalez.net. For the SmartThings Hub, Kevin LaFramboise has provided a thoughtfully developed Aeotec Doorbell device handler. Triggering these MP3 clips to play based on SmartThings device events can be easily accomplished using Adrian Caramaliu‘s excellent CoRE (Community’s own Rule Engine) SmartApp, by entering in the corresponding track number you would like to play for the “Play Track” command available for “Siren” devices. An updated user manual and developer specifications, including command classes, trigger functions can be found on Z-WaveAlliance.org here. I have also placed a copy on DarwinsDen.com here. The process to create the voice recordings is simple, but it can take a while to create all of the tracks that you may be interested in using in your setup. I’m posting the MP3 files I have created so far in the hopes that it can save someone a little time. The audio files below were created using From Text to Speech and then edited with Audacity to 1) remove a few milliseconds from the beginning of the clip in order to reduce just a little of the latency, 2) normalize the audio to increase the volume – since the Aeotec speaker volume has been reported to be a bit low for some users (although it’s been fine for my set-up), and 3) add about 500ms of silence to the end of the clip to keep it from being truncated when played. As detailed in the SmartThings forums, the tracks numbers on the ZW056 end up being based on the order in which there are added to the speaker device. It’s a little cumbersome but on a Macintosh, I ended up just numbering the audio clips and copying them over to the speaker one at a time in their sequential order. The speaker will play the first track when powered on; the first track is a short silent clip so to work around this annoying feature. My apologies – I used the US English voice “Daisy” for these. I really wanted to go with a British accent, but I just couldn’t get past how Emma pronounced the word garage. Let me know if there are others you would like added or if you have clips of your own that you wouldn’t mind having posted for general consumption. Hello! I want to purchase this as a voice device, but I have some quick questions. Have you tried the doorbell and does it work well? Also, what is the delay between lets say a door open and the message playing. Hi Brandon. I initially tried the device as a doorbell, and while it did work acceptably for me, I wasn’t too keen on the aesthetics of the button itself, and in the end, I preferred to use my existing conventional doorbell chime. I wrote a bit more detail in the Aeon Labs Doorbell Review here. I am seeing about a 2-second delay between events, such as a door opening, and the start of the audio. I am using the CoRE SmartApp in SmarthThings to trigger the alerts, which works great, but may be responsible for adding a small portion of that delay. Hi, I also have this Aeon Siren and I’m using it with Smartthings hub. Could you please give me a brief rundown on what the steps are to change to these custom sounds? I’d absolutely love this functionality. Hi Milan. I assume from your comment you have the ZW080-A17 Aeotec Siren? Unfortunately, to my knowledge, that siren does not support custom audio clips. I’ve been using the Aeotec ZW056 Doorbell (more details here) for voice annunciation of my home automation events using these mp3 clips, and it continues to work well for me.